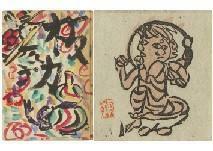 Find artworks, auction results, sale prices and pictures of Shiko Munakata at auctions worldwide. 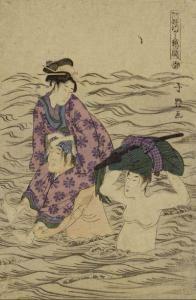 Hankei (Special edition) MUNAKATA Shiko a book containing 23 works (2 woodcuts with hand-color from verso (Kodansha vol. 2 No.207, Kodansha vol. 5 No.154), 20 woodcuts (including Kodansha vol. 1 No.728, Kodansha vol. 2208-214, Kodansha vol. 5 No.142-148, 153, 154), a Yamato-e (ink and color on paper(cover), signed and sealed)), 1943-1944, book size 26.3x18.4cm, signed, with an authenticity certificate by MUNAKATA Shiko Authentication Committee. with a box. A woman with a Balalaika MUNAKATA Shiko Kodansha vol. 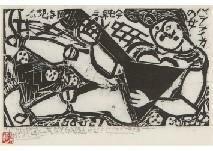 8 No.26, 1962, woodcut, 23x40cm, sheet size 31.1x47.4cm, signed, sealed and dated in the lower left margin, titled in the lower center margin, with a sticker of MUNAKATA Pariji, framed, with an authenticity certificate by MUNAKATA Shiko Authentication Committee. 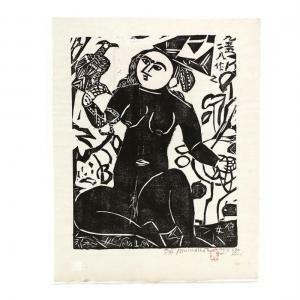 Shiko Munakata (Japanese, 1903-1975) Hawk Woman , ink on paper, signed in pencil in lower right margin in Japanese and English with date of 1958 and edition number 132/200 and below a red artist's seal, also a mark within the paper to the lower left margin, the abstract image with heavy lines shows a voluptuous woman with a hawk perched on her right arm, presented loose. 20 x 15.5 in. Munakata is an internationally recognized master of woodcut prints and admired for his dynamic black and white compositions. 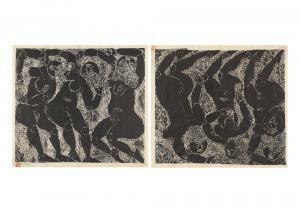 In 1970, he was the first print artist to receive the distinguished honor of the Order of Culture in Japan. His work is prevalent in major museums across the globe.